Kaleb is a powerful speaker, organizer, and leader in his community. He’s also twelve years old. 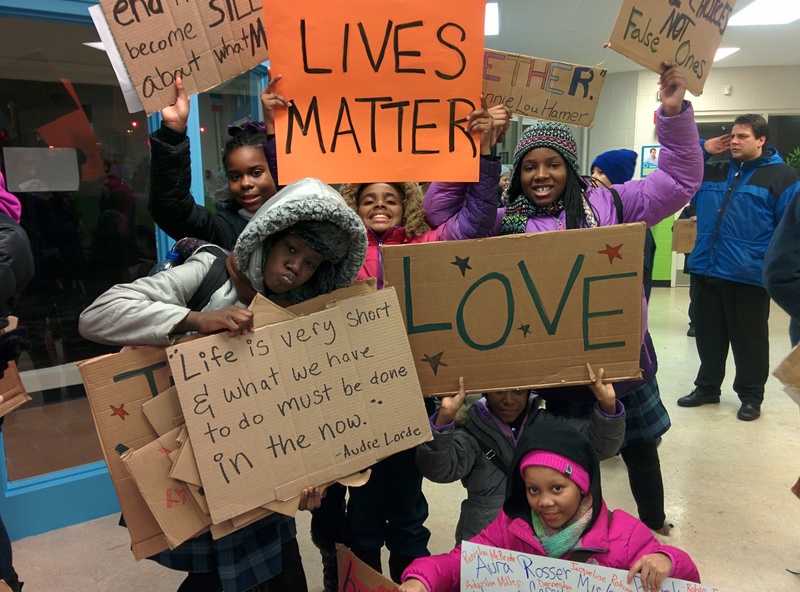 The march, rally, and visuals employed last night were created around the vision of Village Leadership Academy students who sat in meetings for weeks with teen organizers and adult allies, shaping their ideas into a concrete plan of action. Students as young as seven sat in meetings that stretched on for hours, debating imagery, messaging, and making sure their narrative was properly captured. 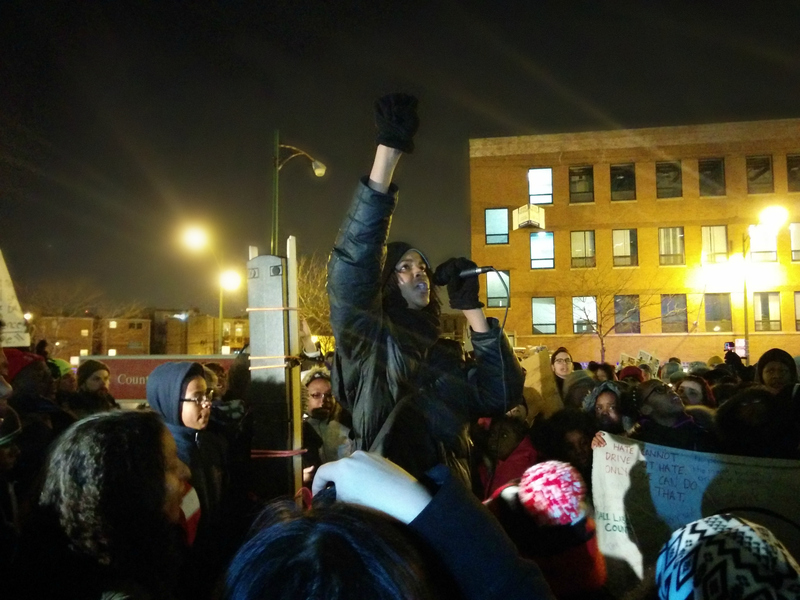 Some aspects of the plan were flexible, but the essential elements were tightly outlined in our group conversations: after a day of solidarity actions (carried out by supportive allies around the city), we would meet outside the Village Leadership Academy, rally the crowd, and then march to the Cook County Juvenile Detention Center, where the main program of the event would unfold. On the evening of the march, we gathered at the school. After opening remarks from young leaders from VLA, We Charge Genocide, and Black Youth Project 100, the students led the way. 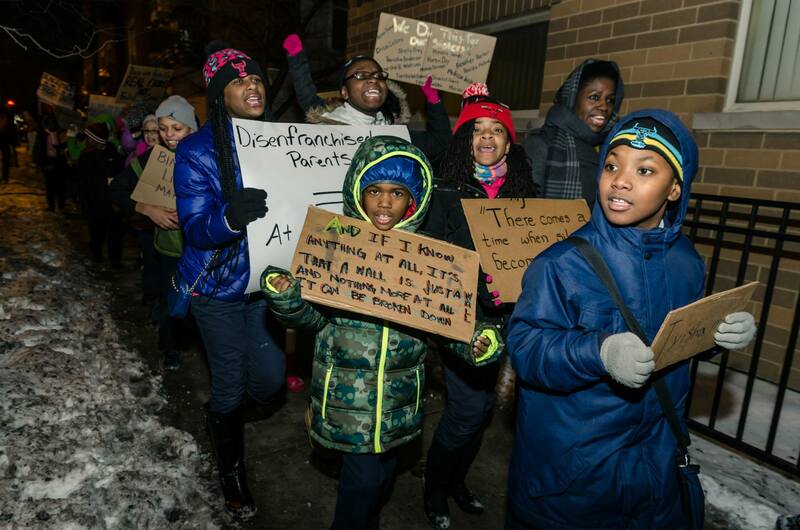 They marched through the snow, from a house of learning to a building that imprisons children. They walked as living symbols of all those who are pushed through the school to prison pipeline each year, with their fists and their voices raised high. Years from now, those of us who had the honor of standing with them will remember well that on January 15, 2015, we marched through the darkness with children who brought light to a prison and demanded freedom for their people. Actually being heard by prisoners inside a detention facility is always a concern at a noise demonstration, so we planned some imagery that we were confident wouldn’t be missed. 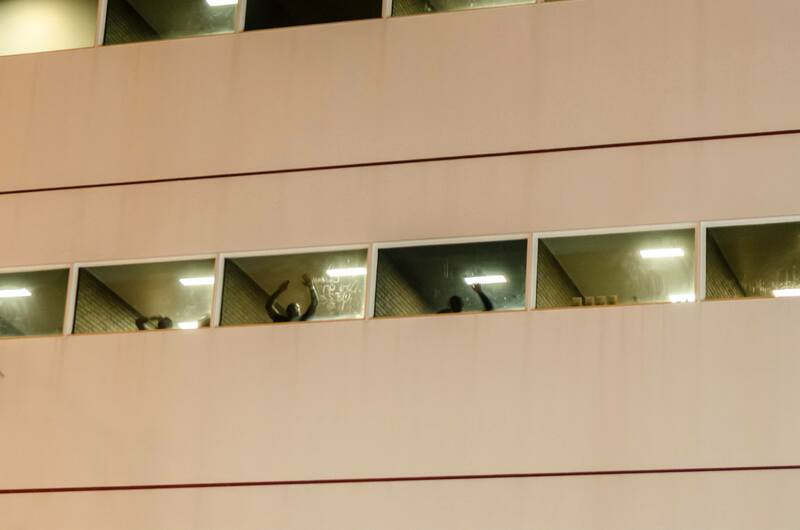 With light boards and a projector, and over the objections of police, we spelled out the words “free us all” and “indict the system.” We could hear the incarcerated youth pounding on their windows as the scene outside unfolded. We could see their silhouettes as they jumped up and down and waved to the crowd. Kaleb and other young organizers led the crowd in chants of love and solidarity as the youth responded to our presence. Eventually, some of the imprisoned youth began to scrawl messages on their windows with soap. As words like, “I love you” and “free us all” began to appear on the glass, I had to step away from the speakers to allow myself a moment to weep. Surrounded by the bright, beautiful faces of young people of color, while looking up at children whose faces were hidden in shadows as they cried out for freedom, I was overwhelmed. VLA student Jakya Hobbs told us, “It is this system that keeps us from the world.” Her use of the word “us” was very intentional in this context. 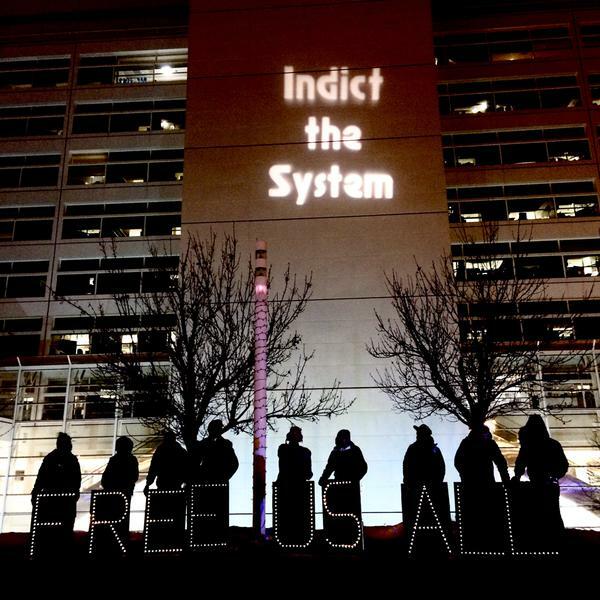 These student organizers see no distinction between themselves and the incarcerated, and rightly believe that as long as black and brown children are criminalized and caged, no young person is truly free. In elementary school, they understand what it took me decades to comprehend: Prisons don’t simply confine prisoners. They confine hopes and ambitions, and dampen the faith of those who might otherwise dare to believe in better things. Living as a black or brown person in a country where the prison industrial complex cages over two million of our brothers and sisters means walking through the world with the knowledge that, while you may have eluded the slave catcher, many of your people will not. In a society that deems your life and freedom wholly disposable, where your oppressors are championed as heroes, the path to revolution is not one of martyrdom. To fight against a system that seeks to diminish or even extinguish your humanity means living in opposition to that system. It means living in the pursuit of a dream that many will claim has already been realized. It means demanding freedom for every person that might be denied it, and building toward transformation. 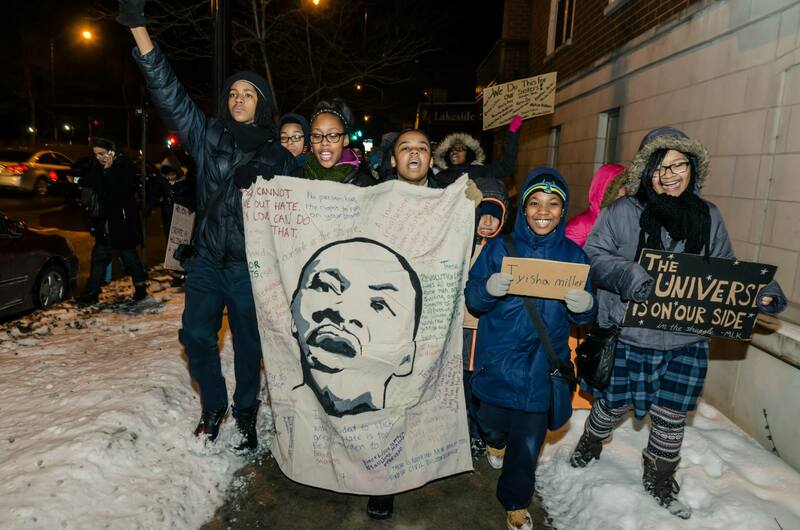 Dr. King once said that, for activists, a “calling to speak is often a vocation of agony,” but building an event alongside these young people, and lifting up their vision and voices, has been one of the most life affirming undertakings I’ve experienced as an organizer. I am deeply grateful to have stood with them, and to have shared such a powerful evening with such a beautiful community.